Fibromas are benign skin growths which, by definition, are actually benign tumors of the connective tissue. They look like small soft nodules, and can vary in size from a few millimeters to a centimeter. They usually are the same color as skin, but can also be brightly pigmented. The changes are not malignant, but with time they grow and become more noticeable, therefore becoming an aesthetic problem. 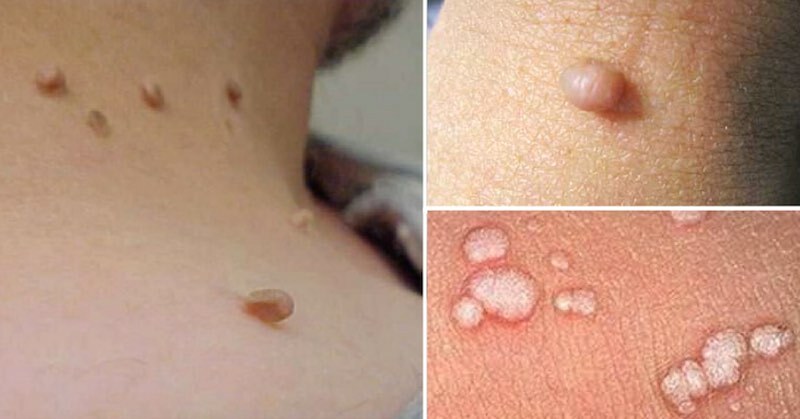 They most commonly appear in places where the skin is rubbing, so usually on the neck, armpits, groin, feet, stomach, eyelids, but can also occur elsewhere on the face. They could cause problems as they occur in areas where skin rubs so the spot can become painful and become inflamed. The good news is that you can remove them without bleeding and scarring, with only one ingredient, and that is malic acid. Malic acid is a naturally occurring compound found in apples and apple cider vinegar. It has been proven to reduce muscle soreness and pain in people who suffer from fibromyalgia and chronic fatigue syndrome. It has also been shown to be an effective energy booster. Caution: Malic acid should never be used for removal of fibroma of the eyelid! Carefully wash the place around fibroma with water and mild soap. During the first time, soak the fibroma in water for about 15 minutes. You can do this by putting a soaked cotton on it, or perform the following after a good shower. Soak a piece of cotton with apple cider vinegar and then lightly squeeze it to remove the excess vinegar. Place it directly on the fibroma and fix it with a plaster or bandage. Leave it for 15 minutes, then remove and rinse with water. Depending on the fibroma size or how deep it is in the skin, it may cause minor skin damage (a little hole), so marigold grease or aloe vera gel should be applied on the skin to allow it to heal. If the fibroma isn’t grown deep into the skin, there won’t be a scar if the procedure is done carefully. Castor oil is another powerful compound you can use to remove skin tags, corns and warts. Take a cotton wool, soak it in castor oil and press out the excess. Put the soaked cotton over your skin blemish and secure it in place with a bandaid. Some people use a piece of duct tape that works equally as well. The oil will soften the tags, corns, warts and all, within a few days and drop off without scarring. Remove and change the dressing every day until you achieve your desired results. Also read: 6 Easy and cost effective home remedies for warts.